Here is Lucy’s birth story from her beautiful mama, Emily. So blessed to have served this family. I like to talk about my first birth whenever I share any of my birth stories. I think they go hand and hand. We used the Bradley method when we had Hope in a hospital in Alabama, where we were stationed at the time. The birth was fantastic, the typical birth. Woke up in labor, and it slowly accelerated through the day, and I pushed her out in 45 minutes. I did tear significantly and the immediate post-partum was awful. The pediatric nurse was not in agreement with our birth plan, wanting to cut the cord and take baby immediately, she tapped her foot in a hurry it up way when I was pushing. My doctor and nurse were very supportive. We waited for the cord to stop pulsating and enjoyed immediate skin to skin. When the pediatric nurse took Hope after the cord stopped pulsating, she did so with much aggression and attitude. She punctured her lung in the process of suction. Hope did not breathed any differently than my next two babies and they required little to no suction and only with a bulb syringe. Hope spent the first 36 hours in the SICU, it took a bit to bond with her and to feel like a mom. While Jimmy attended to her, by bff stayed with me. She noticed my color go to white and I became unresponsive. I had become so dehydrated from throwing up in labor and hemorrhaging after, my blood pressure dropped to 40/20. It took a bit of time and meds to bring me back. The biggest things I took from her birth was I would only have a supportive birth team and I would never go into a hospital again. So when we got to our next duty station, North Carolina, I found our home birth midwife. She was with me through a loss of a baby, Elise’s birth and the first two trimesters of Lucy’s pregnancy. She also became our close friend. When we moved to Texas, I used a midwife in a practice that a good friend used. Every time I left, I felt unimportant and forgotten. It was so different than what I was used to, but I assumed it was hard to keep up with me since it was so late in the game. I also felt trapped because my insurance would only pay for a CNM and most in the Houston area are CPM’s. This midwife also starting making mistakes that made Jimmy and I both concerned with the level of care that I would receive at our home birth. My husband was scheduled to miss the birth due to army training, and we felt that we needed to find another midwife. We asked my doula for references and she gave us two. We interviewed Shannon, who met us at 36 weeks the same night we called her. My husband and I both loved her, she was very knowledgeable, had a good plan for my hemorrhage risk, loved the Lord, and we just left feeling at peace- something I’d never felt with the previous Houston midwife. Plus, I felt like I’d known her forever. When you look at the midwifery model of care and what I had experienced in North Carolina with Donna, Shannon was exactly what we needed. And as it turned out, God was moving big to get us with Shannon. Well, my due date was originally July 29, and then the ultrasound I had at around 11 weeks put it at August 1. I thought I would go early and started having your body is ready to go into labor signs at about 38 weeks. I even thought my outer bag broke at one point, but it’s amazing what your body can do when you are pregnant! It’s so gross. Donna had always said that your third pregnancy/birth is a wild card and it proved true for me. Weeks 38, 39 and 40 passed me by. During my 40th week, Jimmy had a long layover in Houston. I was hoping to go into labor or be in labor while he was here, which I did not. I was pretty mad and just did not understand what the Lord was doing. Late week 40 and week 41 came and I was shocked to still be pregnant. I stated doing acupuncture and seeing my chiropractor more. I got weekly pedicures. I took the herbs. Nothing. Even the earlier signs that I was going to go into labor soon vanished. I was tired. It was hard being a ‘single mom’ that pregnant. I was so thankful to have our parents so close though as they were very helpful. Well, I found out during that time that Texas state law prevents my midwife from attending my home birth after 42 weeks and tries to make you feel like an induction is your only other option. We went back and forth with the options and felt trapped if I went past 42 weeks. I had an ultrasound that showed Lucy to be healthy (but large), placenta to be good and the fluid level to be good. There was no reason to introduce labor. The medication used for inductions would only increase the risks surrounding a late term baby. We decided that if I went past my 42 week mark, I would go into labor naturally (keeping a close eye on Lucy and myself of course) and walk into a hospital about to push a baby out. Shannon agreed to attend our home birth into our 42nd week up until she left for a well-deserved vacation. Had we not gone with Shannon, our old midwife would have dropped us at 42 weeks on the nose (keeping our money of course) and we would have had no other option then a hospital birth. 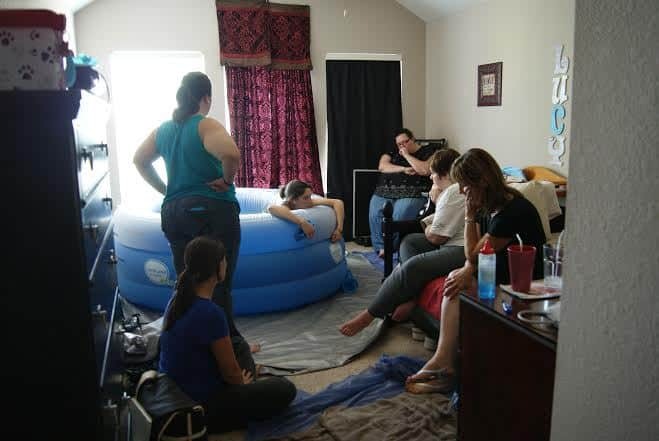 During all of this, I was able to doula my sister’s birth of her daughter. It was amazing. Even though she was due 18 days after me, I was elated to be there and help her as she became a mother. Friday, August 16 at 42w1d I was done. I decided to let Shannon strip my membranes on Thursday. Then again on Friday. Twice. I had a pedicure. I was taking black cohosh like a fiend. The acupuncturist that Shannon works with came over Friday evening as did Shannon and she stripped my membranes again and he tortured me with labor inducing acupuncture and acupressure. With my sensitive skin, he actually rubbed my forehead raw so I looked a little middle-eastern. I called my bff’s and said it’s probably going to happen tonight if you want to come out (and they did because they rock). My mom came as well as Karen Bright and my doula, Joanne. After acupuncture, we walked. And walked. And did stairs. Contractions increased! About midnight Shannon asked if I thought we should get the assistants there and I said yes. We were going to have a baby. It could be 4 hours or 14, but we would have a baby. I rested and it seemed that when I did, my contractions would really pick up and be consistent. The more I walked and did all the things you are supposed to do in labor, they would slow down. Sometime mid-morning, Shannon mentioned breaking my water. The bag was very bulgy and with as big as Lucy was it might have been preventing her from getting into position. I wasn’t quite ready to break it as it put me on a time table and there were risks with it. Meredith and I kept whispering like school girls how we couldn’t believe my labor. We needed to get moving, we needed to walk this baby out but the only thing that worked was laying on my left side! It was so frustrating. While this was going on, we were also having technical difficulties with the hot water and people kept spraying the ceiling, wall and each other with the hose. It was so funny. There was a lot of laughter. The acupuncturist had hit some points that released fluid. and I peed so much I used an entire roll of toilet paper. And they were the super big rolls! Around noon, Meredith came to me and we talked about breaking water. I asked her what she would do in my situation, and she said break it. I was getting really tired. So I talked to Jimmy and see if he would be in agreement (fortunately he had a middle of the night flight so he was available during the day). I asked if he’d be able to get on Skype because once we broke waters, things could move very fast (or not). He was in agreement and so we broke my water. He called me back about an hour later and he told me he couldn’t be on Skype. He had worked it out with his instructor and fellow student so that he was able to finish his training early and was getting on a plane to come home. How amazing God orchestrated this birth. Why I was late, why nothing worked, all the whys were answered in that moment. The ladies and I laughed about how Jimmy was coming home to a Gandhi look alike, with my red mark on my head and in a diaper. Once he landed, I was entering transition. He kept trying to talk to me and I physically could not speak to him or anyone. I got in the birth pool and every time they added hot water, Lucy’s heart rate would go up. She is very sensitive to hot! Transition was hard. My contractions were so super intense. The worst I’ve ever experienced. Jimmy showed up, he quite literally got out of the car while it was still rolling, flew up the stairs and was there. He said a quick hello to Hope and changed and got next to me. I wouldn’t let him in the pool with me though, it was uncomfortable. I could only handle one of the ladies putting counter pressure on my back. People kept moving my hair or giving me position suggestions and I could not focus on anything but getting through the next contraction. I was in transition for about 2.5 hours, the contractions were far apart (7-9 minutes) and I would rest in between, but it took all of me. I would throw a hand up during some contractions, and someone was always there to hold it and let me squeeze. I kept thinking of ways to get them to get me drugs and saying I didn’t want to do it anymore and all the transition things you do, but I had never done those things with my other births. When I wanted to give up, Shannon, Meredith and Joanne would encourage me. I cried, ‘She’s not coming’ and in the next breath I was pushing. It was hilarious. Shannon supported my perineum and at one point it tickled me and I made an inappropriate comment, laughing and everyone joined in the laughter. I pushed 14 minutes, screaming with each push right in Meredith’s face and then Lucy was out. Shannon said, ‘reach down and get your baby’ and I did. And she was beautiful and huge. I said, “we did it,” and it really felt like ‘we’ did. She was a little gray so we gave her some oxygen and she pinked right up. We immediately gave me some Cytotec and juice to help with the hemorrhage risk. I did hemorrhage before the placenta was even delivered. I was never scared or lost consciousness, Shannon was able to get it under control very quickly. Lucy latched on very quickly after she was born which helped a lot. My placenta delivered, it was almost as big as Lucy. Once the bleeding was under control, Hope came in and she and daddy cut the cord. She was so brave. Elise got home and was overwhelmed. I think she thought Jimmy came out with the baby! Lucy and I got into an herbal bath while Shannon and her assistants cleaned up everything. It was a hard birth, but it had such moments of fun and beauty. It was amazing to have my husband there and be surrounded by amazing women who loved the Lord. To have my midwife and friend walk the entire labor process was such a gift. Sharing it with all the women who were there was just so neat. They stayed up all night, praying over me, encouraging me and loving me through it all.